Anyway, before I went, I finally cracked and downloaded Hipstamatic, on the strength of an excellent article in this month’s Jamie magazine on food photography with phones. I’m still getting to grips with the angle though, as you might be able to tell. Getting a 6am flight is definitely rewarded if this is the sight that greets you at the top of the mountain: tartiflette with cured ham and one of those simple green salads the French still kick our arses at. The nice bit about this was that Richard left me all the gooey cheese from the top. He is a great person to share food with. 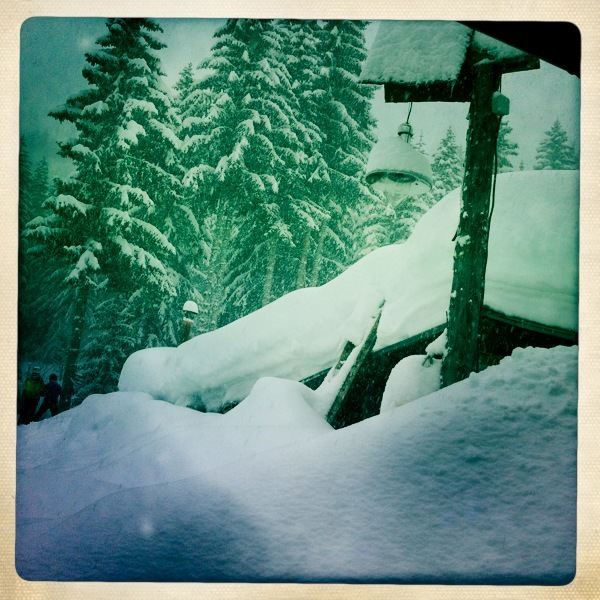 The next day, we ventured further afield, to a restaurant you actually had to ski to. Admittedly, even I could make it down there in four minutes. I made a bad choice here. 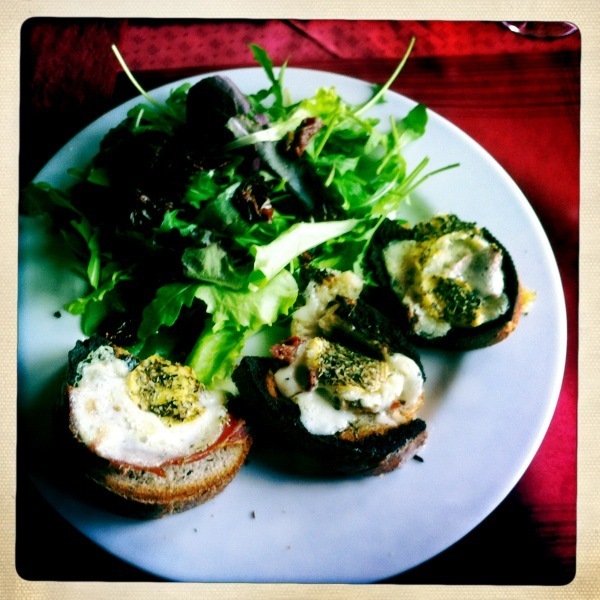 Raclette toasts (with typically unannounced ham concealed beneath – take that, les végétariens!). Good salad (although sun-dried tomatoes were an unwelcome taste of the nineties) but I should have had the Savoyarde omelette with ham, cheese and potato. I definitely would have skied better that afternoon. 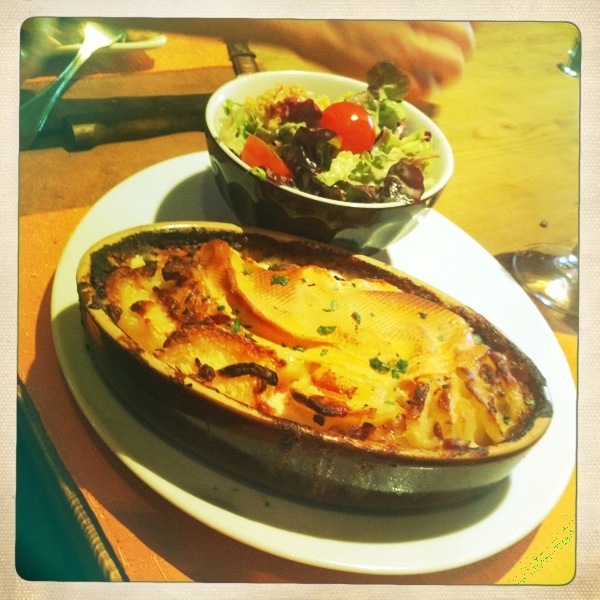 Still, the next day’s lunch at the Alsatian La Raviere made up for it – even though the snow was so deep I fell over 72 times on the way. 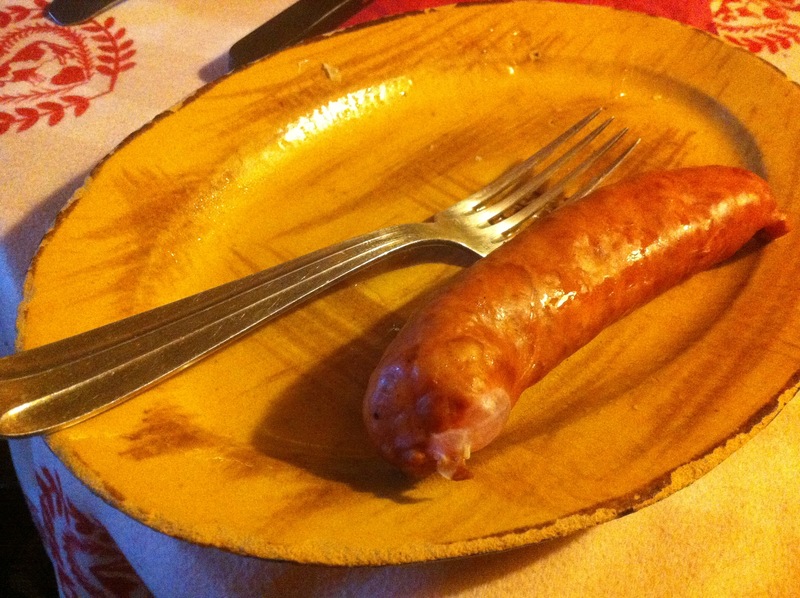 Sticking my snood on the stove and downing some of this cider steadied my frozen nerves somewhat, ready for the most incredibly gooey cheese tart I have ever eaten, a very serviceable onion version, charcuterie and cornichons galore, and this magnificent smoked sausage, served with rosti. They gave us an extra sausage by mistake, but no one could quite face putting it into their trouser pocket for the way home. Which proved to be a bit unfortunate, because someone lost his ski, and then, thanks to an overabundance of snow, they closed the lifts, and we were left stranded. That sausage would actually have come in pretty handy. This is the view from the restaurant porch, where we enjoyed our digestif schnapps, unaware of the horror that lay ahead. It’s pretty snowy, as you can see. 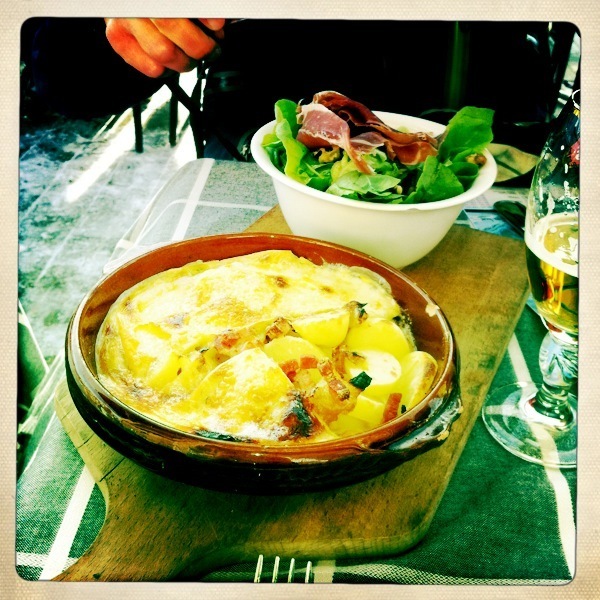 The best tartiflette of the trip was at Les Mandarines on the last day – washed down with a crisp Campari. (Odd, and yet definitely satisfying combination.) I particularly liked the entire rind melted into the top, and the fact they’d used cream, which took it into dauphinoise territory. Cheesy, bacony dauphinoise. The dauphinoise from heaven. 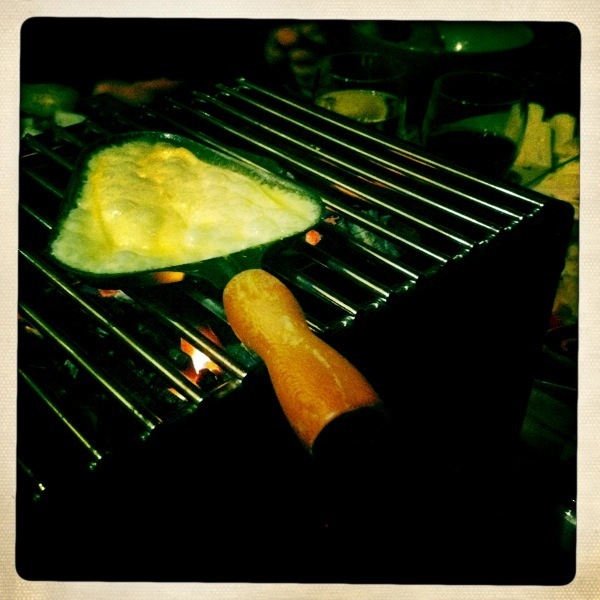 And then, of course, the raclette proper. 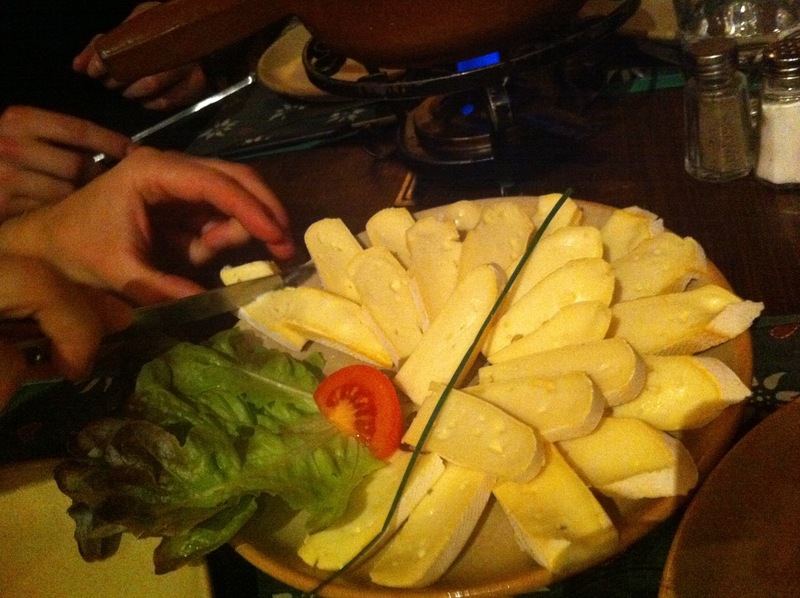 I’m not familiar with this style, where you heat individual pieces of cheese on a little shovel – we got the wrong end of the stick initially and put them on top of the heat, as in the photo, until the waiter came and told us off. Apparently they go underneath. Who knows what the top bit’s for. Mmmm… cheese. No wonder we had a nice M&S edamame on the train home that evening. Here I was thinking that Megève was for posh people 😉 – My perfect idea of a mountain town is Chamonix and that’s exactly where me and the family are off to next month. It has a better spectrum of restaurants & it also has a traditional market every Saturday. Megève is just a bit too CHEESY for my liking but each to their own as they say. PS: Photos look good for I presume an iPhone 4G Felicity? – I am looking forward to trying out the 4Gs camera next month. Pretty piccies. Want cheese. And it’s only 9.46 in the morning, damn you! sven – it was indeed. Lucky old me. Fergus – have to admit we didn’t see that much of Megève, because the food in our chalet was so damn good (somehow we lucked out with a chef trained at Claridges and the Glasshouse, rather than a hungover 18-year-old), but the fur and facelifts on the slopes were quite something to behold. Certainly a bit different from Bulgaria, where I’ve skied before anyway. And no, it’s only an iPhone 4. Hipstamatic just makes things look better. Kavey – my mountain food obsession has just lighted upon polenta. Also better with cheese. Although I’m going to have to work on bothering to get rid of the lumps before eating it out of the pan. Yes but not bad for the the iPhone 4, like I said I’m looking forward to my upgrade next month to the 4s. 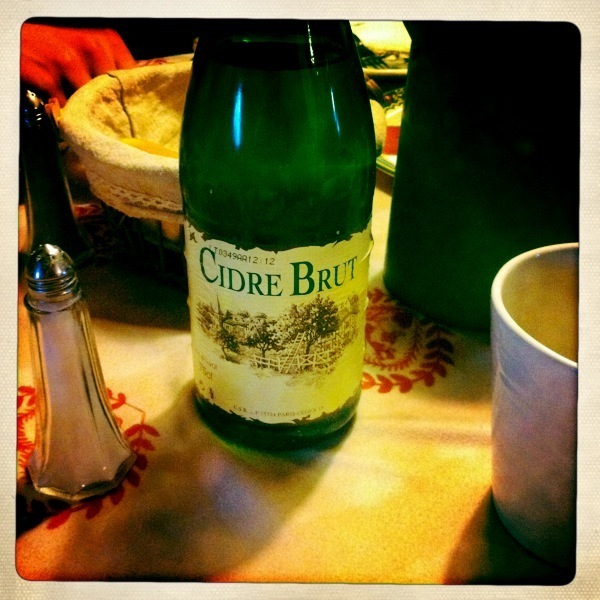 I will try Hipstamatic. How on earth did you fit in with the Real fur 😦 & fake faces?! re uploading a photo – on the WordPress dashboard, under Quickpress, above Content at Upload/Insert is a graphic that looks like a camera with musical notes (ditto Upload/Insert in Editing your post). Click on that and drag and drop or find the image on your computer. It works easily on Mac – I hope that as a good journo you don’t use Windows! Naturally, as a good freelancer, I have spent over the odds for a Macbook when clearly Windows would have done. But my problem’s with Instagram: if it lets you upload photos automatically to Twitter and Facebook, it seems nonsensical that it won’t let you do the same to a blog. Grrr! All my bee-yoo-tiful photos, wasted. Erm… Windows never “does” IMO. But Instagram doesn’t seem to do other than Facebook, Twitter or Flickr. Have you tried the latter? You can drag from Flickr to the desktop on your mac. That way you’d probably have better quality too.